Please note that HEXTA-001 has been superseded by the next generation HEXTA-002 system. Please see HEXTA-002 product description page. Also please read FAQ page for more information. 8 sensors in combination with sophisticated algorithms and real time data statistical data analysis allowed a dramatic improvement of the accuracy and reliability of the system. The probability of unregistered shots or miscalculation is dramatically low. In fact to date over a millions shots fired to the target and we have no explainable evidence of “unregistered” shots. Can detect the subsonic shots. Also not additional error is introduced when projectile travels close to speed of sound. The system supports up to 64 targets. For a range with more than 64 targets a special arrangement required. 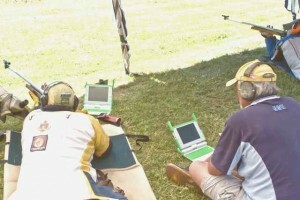 The system offers a complete wireless sun-readable portable solution for the shooters station. 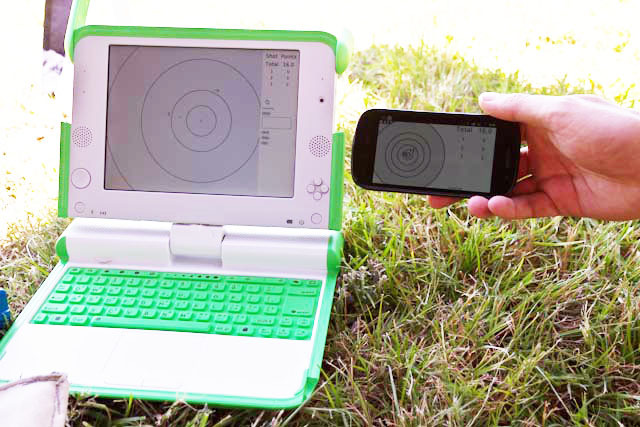 It is designed as a system of independent shooting stations. This means that a Club can raise and connect a target to the system that is already in operation by other Clubs, start shooting when they are ready, and pack away when they want to independently of the other Clubs. There is no interruption of any kind to the other targets, monitors or shooters. Any system which supports WiFi and has a modern web browser (PC, Laptop, Smart Phone, iBook, iPhone, iPad, etc) or a combination of different systems can be used as a shooting station or a scoring/spectator monitor. No special software installation is required. Active sensors are designed with electromagnetic compatibility and interference (EMC/EMI) consideration, which makes the system more immune to the effects of nearby transmitters, power lines, mobile phones and other electromagnetic emissions equipment. Target dimensions and rules are easily configured by users. This means that implementation of new targets can easily be done by a user selecting variables such as squares, rings and grid dimensions and colours, shot values, target description, class description (eg: Full Bore, F-Class, F-Open etc), shot description for each class (eg: Magpie, CenterBull, SuperCenter, etc), counting score, number of sighters, greed dimensions (1″ or another value), Plot font size, etc. The caliber diameter is taken into account during score calculations and it is configurable (default = 7.82mm (gauge diameter)). Standard and widely available hardware accessories like telephone cable and connectors, network cables and network connectors etc are used as much as possible for the system, allowing for easy maintenance of the system. The system is flexible. It means new features can be designed and implemented without any interference with the hardware like smart-cards, barcode, QR Code, RFID or other readers. The software is easily set to allow for the number of sighters and the number of scoring shots required. It also allows for those occasional “miss” shots, and the optional sighter that may happen from time to time. You can even disown a shot if a friendly neighbor decides to try out your target. The designed flexibility of the system means that new features like smart-cards, barcodes, QR codes, RFID, NFC or other readers can be simply integrated to suit the Club, DRA or competition requirements.